As your insurance company, West Bend's job is to help you when you have a claim. And we'll be there if that happens. There are, however, other ways we can help you with services you're more likely to need. We can help you pay your premium, answer your billing questions, and share ways you can keep your family, auto, and business safe. 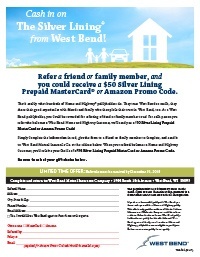 Refer a friend or family member, and you could receive a $50 Mastercard or an Amazon Promo Code! Click on the graphic for a printable referral form.